[SlideDeck2 id=42806 iframe=1]Officials stationed the statue of the Forlorn Soldier on Airport Road in Hartford’s South End for over 45 years—having moved it from Charter Oak Avenue in the spring of 1968. There it stood amidst an industrial, urban backdrop. 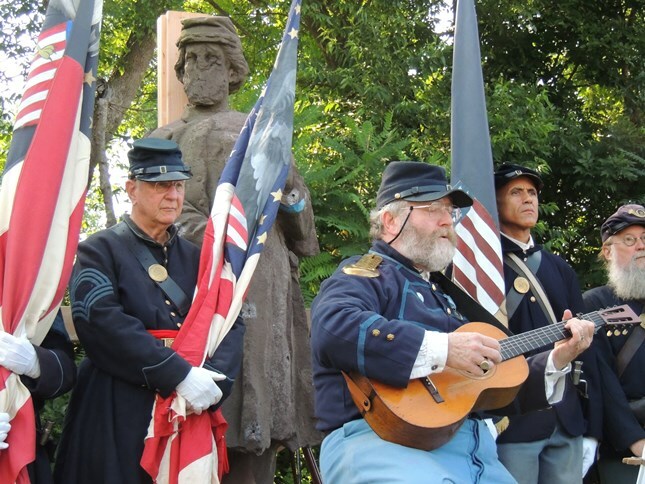 On July 19, 2013, the Connecticut Civil War Commemoration Commission held a ceremony to honor another relocation of the statue. Before being lifted onto a truck, a color guard of Civil War reenactors honored the Forlorn Soldier. Peter G. Kelly and several of his family members attended and Tom Callinan, Connecticut’s former state troubadour, performed an original song dedicated to the Forlorn Soldier. The Mariano Brothers Specialty Movers used a crane to set the statue onto a truck bed. From that location they transported the Forlorn Soldier to ConservArt in Hamden, Connecticut. Francis Miller, the proprietor of ConservArt, worked over the next two months to stabilize the statue and repair previous restoration attempts before its final move to the Connecticut State Capitol. “Video - Ceremony to Relocate the Statue of the Forlorn Soldier.” Connecticut Network, July 19, 2013. Link. “Video - State Capitol Dedication Ceremony For The Forlorn Soldier Statue.” Connecticut Network, September 17, 2013. Link. Dixon, Ken. “‘Forlorn Soldier’ Assumes New Post.” Greenwich Time, September 17, 2013. Link. Drury, David. “Hartford’s ‘Forlorn Soldier’ To Get A Makeover.” Hartford Courant. July 19, 2013. Link.